I thank His Excellency Chief Dr Willie Obiano(Akpokue Dike) Executive Governor of Anambra State for appointing me SSA to the Governor on Creative & Entertainment Media. Thank you sir for seeing the zeal in me to serve the people and believing in me. Special thanks to Ndi Anambra, Ndi youth for your support and prayers, I will not let you down. 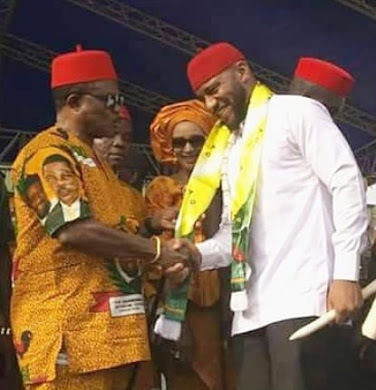 Thank you to Senator Victor Umeh (Ohamadike), Chief of Staff of Anambra Primus Odili, Hon. Chinedu Obidigwe (Egbe ana agba Anyanwu), SSA on Project monitoring, parks and markets Hon. Chiejina Obieze (Onye rikanne) and many more. To all my fans and friends all over the world, thank you for your support, love and prayers. I got into politics so I can better the lives of the people. That vision will never change.